- The 20 years old Amjad Hatim Al-Jundi killed on October 7 was from Yatta in Hebron district, an area that is currently under extreme pressure to be ethnically cleansed from the Palestinian population. Home demolition, settler attacks, denial of access to water make life unbearable. According to Israeli sources, Amjad was killed in Kiryat Gat in the Naqab (Negev) after he allegedly took the weapon of an Israeli soldier was able to escape to an apartment building. - Israeli forces injured 288 Palestinians during this day, including 10 civilians with live ammunition and 89 with rubber-coated bullets and 189 suffered from respiration problems due to tear gas. - Two of the injuries with live ammunition have occurred in Jericho governorate, where 55 have been wounded with rubber-coated bullets and 155 have suffered from respiratory problems due to gas suffocation. 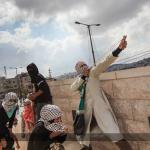 - Two people have been injured in Ramallah with live ammunition at close range by Israeli undercover agents. The occupation forces wounded 28 with rubber-coated bullets and six people had to be treated for tear gas inhalation near "Beit El" military base in the West Bank. Besides the case of Amjad Hatim al Jundi, in four other cases, Israeli forces claimed Palestinians had perpetrated stabbing attacks. In at least one case eyewitnesses relate that it was instead a case of an attack by settlers. Another such case that has been recorded no video, is the murder of Fadi Alloun (21), who was shot dead by Israeli police on settlers’ orders, in the Bab Al-Amoud area (Damascus Gate) of Jerusalem. In those cases, where de facto stabbing attack occur, they are the direct result of Israel’s ongoing policies of oppression and dispossession, particularly in Jerusalem, that make Palestinian lives impossible. - East of Jerusalem, Israeli soldiers opened fire on a car and wounded the 30 year old driver, claiming that the driver tried to run over soldiers at a checkpoint close to Ma’ale Adumim. - 18 year old Shurouq Dwayyat has been seriously wounded in the Old City of Jerusalem when a Israeli settler shot her claiming she tried to stab him. According to eyewitnesses, the settler assaulted the girl and tried to remove her veil, while the girl tried to defend herself. - A Palestinian was wounded and arrested in Petah Tikva near Tel Aviv when, according to Israeli sources, he attacked three settlers with a knife. - Occupation forces arrested a Palestinian youth claiming that he tried to stab a soldier in al-Tur neighborhood. - Raids and mass arrests, especially targeting young Palestinians in various villages, lead to the imprisonment of 47 Palestinians, including 27 from Hebron, including 7 children, and 6 of the Jerusalem Governorate, including a child, and 5 of Nablus, and 6 on Jalama roadblock in Jenin. - Israel deployed four new military battalions in the West Bank and additional four thousand police and special forces in Jerusalem. They are still heavily deployed on the main streets and at checkpoints in various areas. - Confrontations with occupation forces started at noon time and lasted until midnight in more than 50 locations in the West Bank and Jerusalem. - There have been over 145 clashes with occupation forces recorded in these areas. - Palestinians defend themselves from daily attacks by settlers at the crossroads of the main roads and at the entrances to Palestinian villages near the settlements. - Groups of settlers attacked Palestinian houses in Tel Rumeidah in the center of Hebron. - A group of settlers attacked Palestinian cars east of Bethlehem. - Violent confrontations have been ongoing in the town of al Aizariya, East Jerusalem, where many suffered from suffocation with tear gas and injuries with rubber-coated bullets. - Clashes intensified close to the ‘Beit El’ settlement, north of al Bireh. Israeli soldiers opened fire towards the protesters and many had to be transferred to the Palestine Medical Complex. - A student protest started from the vicinity of Bir Zeit University towards the settlement of Beit El, north of al Bireh. A number of young people have been injured by the occupation forces in the vicinity of the settlement. - Clashes continued near the house of the martyr Amjad in the town of Yatta, in Hebron district, as occupation forces unsuccessfully attempted to break into the house to prepare the demolition of the house. - Clashes broke out between youth and Israeli forces in the town of Beit Ummar, north of Hebron. There have been various clashes on the roads in Beit Ummar area. - Clashes around the settlement of ‘Kiryat Arba’, in the center of Hebron, have lead to six Palestinian youth being injured by rubber-coated bullets. - Israeli occupation forces broke into the home of the Shurouq Dwayyat in Sur Baher, that was attacked and wounded by a settler in Jerusalem. - Clashes erupted in the town of Zair in Hebron as well as in Kafr ad Dik west of Salfit. - Clashes between the occupation forces and young people continue in several areas, including the following areas: Beit Iqsa, Tulkarem, Bil'in, Ar-Ram, Boudrus, Beit El, Al Khadr, Biddou, Arroub refugee camp, Mount of Olives, Kharsa, Qalandiya, Al-Libban ash-Sharqiya , Turmus'ayya, Jerusalem, around Kiryat Arba, Abu Dis, Al-Jib, Silwan, Sinjel Husan, Al-Tur, Al Aizariya, Umm el-Fahm, Lod, Bethlehem, Hebron, al Bireh, Qalqilya, al Baqa’, Beit Ummar, Beit Awa, Rachel's Tomb, Halhul, Um Tuba, Harmalah, Hizma, Damascus Gate, Issawiya, al-Tura al Gharbiya, Jericho, Itqu’a.